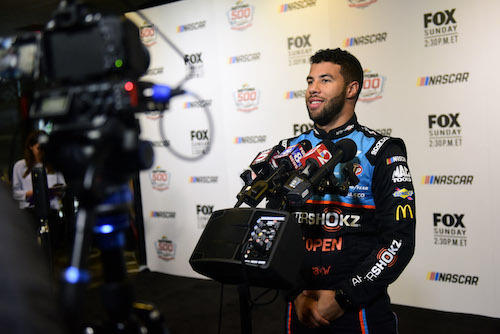 Darrell Wallace is one of at least three Monster Energy NASCAR Cup Series regulars with plans of double-duty at Martinsville (Va.) Speedway this weekend, with entries in Saturday’s TruNorth Global 250 NASCAR Gander Outdoors Truck Series race. Also on the entry list are Austin Dillon and Kyle Busch. Wallace will pilot the No. 22 AM Racing Chevrolet normally driven by Austin Wayne Self. Self has driven the No. 22 to one top-10 finish, a ninth in the season-opening race at Daytona (Fla.) International Speedway, in the first three races of the season. He finished 27th and 15th, respectively, in races at Atlanta Motor Speedway and Las Vegas Motor Speedway. Wallace has six wins in 46-career Truck Series starts. Two of those wins came at Martinsville in 2013 and 2014. He last competed in the Truck Series in 2018 at Kansas Speedway.